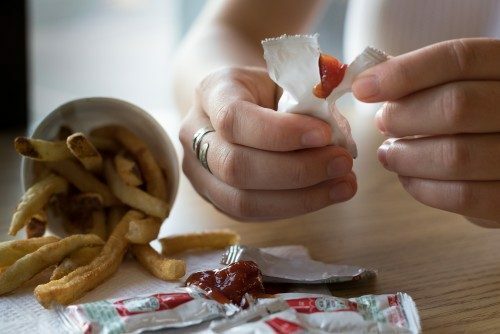 (Newswise)–Almost everyone who eats fast food is familiar with the frustration of trying to squeeze every last drop of ketchup out of the small packets that accompany french fries. What most consumers don’t realize, however, is that food left behind in plastic packaging is not simply a nuisance. It also contributes to the millions of pounds of perfectly edible food that Americans throw out every year. These small, incremental amounts of sticky foods like condiments, dairy products, beverages, and some meat products that remain trapped in their packaging can add up to big numbers over time, even for a single household. New research from Virginia Tech aims to cut down on that waste – and consumer frustration – with a novel approach to creating super slippery industrial packaging. The study, which was published in Scientific Reports and has yielded a provisional patent, establishes a method for wicking chemically compatible vegetable oils into the surfaces of common extruded plastics. Not only will the technique help sticky foods release from their packaging much more easily, but for the first time, it can also be applied to inexpensive and readily available plastics such as polyethylene and polypropylene. These hydrocarbon-based polymers make up 55 percent of the total demand for plastics in the world today, meaning potential applications for the research stretch far beyond just ketchup packets. They’re also among the easiest plastics to recycle. “Previous SLIPS, or slippery liquid-infused porous surfaces, have been made using silicon- or fluorine-based polymers, which are very expensive,” said Ranit Mukherjee, a doctoral student in the Department of Biomedical Engineering and Mechanics within the College of Engineering and the study’s lead author. “But we can make our SLIPS out of these hydrocarbon-based polymers, which are widely applicable to everyday packaged products.” First created by Harvard University researchers in 2011, SLIPS are porous surfaces or absorbent polymers that can hold a chemically compatible oil within their surfaces via the process of wicking. These surfaces are not only very slippery, but they’re also self-cleaning, self-healing, and more durable than traditional superhydrophobic surfaces. In order for SLIPS to hold these oils, the surfaces must have some sort of nano- or micro-roughness, which keeps the oil in place by way of surface tension. This roughness can be achieved two ways: the surface material is roughened with a type of applied coating, or the surface material consists of an absorbent polymer. In the latter case, the molecular structure of the material itself exhibits the necessary nano-roughness. Both techniques have recently gained traction with startups and in limited commercial applications. But current SLIPS that use silicone- and fluorine-based absorbent polymers aren’t attractive for industrial applications due to their high cost, while the method of adding roughness to surfaces can likewise be an expensive and complicated process. “We had two big breakthroughs,” said Jonathan Boreyko, an assistant professor of biomedical engineering and mechanics and a study co-author. “Not only are we using these hydrocarbon-based polymers that are cheap and in high demand, but we don’t have to add any surface roughness, either. We actually found oils that are naturally compatible with the plastics, so these oils are wicking into the plastic itself, not into a roughness we have to apply.” In addition to minimizing food waste, Boreyko cited other benefits to the improved design, including consumer safety and comfort. “We’re not adding any mystery nanoparticles to the surfaces of these plastics that could make people uncomfortable,” he said. “We use natural oils like cottonseed oil, so there are no health concerns whatsoever. There’s no fancy recipe required.” While the method has obvious implications for industrial food and product packaging, it could also find widespread use in the pharmaceutical industry. The oil-infused plastic surfaces are naturally anti-fouling, meaning they resist bacterial adhesion and growth. Although the technique may sound very high-tech, it actually finds its roots in the pitcher plant, a carnivorous plant that entices insects to the edge of a deep cavity filled with nectar and digestive enzymes. The leaves that form the plant’s eponymous shape have a slippery ring, created by a secreted liquid, around the periphery of the cavity. When the insects move onto this slippery ring, they slide into the belly of the plants. “This slippery periphery on the pitcher plant actually inspired our SLIPS product,” said Mukherjee. The pitcher plant’s innovation – which engineers are now copying with great success – is the combination of a lubricant with some type of surface roughness that can lock that lubricant into place very stably with surface tension. “We’re taking that same concept, but the roughness we’re using is just a common attribute of everyday plastics, which means maximal practicality,” said Boreyko.